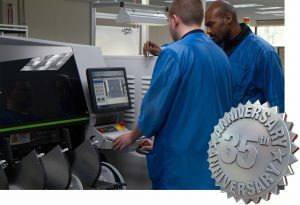 Annapolis Micro Systems Hosting 35th Anniversary Seminar and Open House - Annapolis Micro Systems, Inc.
Annapolis Micro Systems, a leading FPGA board and systems supplier, is hosting a 35th Anniversary Seminar and Open House at its Annapolis, Maryland headquarters on June 8, 2017. The event is free and is open for registration for all customers, partners, and prospects. Register here. The event will include a Seminar and an Open House. Attendees are welcome to attend either one or both. Registration is required. See the agenda and register here. Annapolis Micro Systems was incorporated in 1982 as a services-based company, with two employees, including our president, Jane (Jenny) Donaldson. Early customers included Comsat and IBM. Developing and prototyping products for other companies enabled Annapolis to gain expertise in printed circuit board design, software design, processor architectures, FPGA processing, and surface mount manufacturing. Annapolis was one of the first companies to harness the power of Xilinx FPGAs. Chassis and Backplanes – 100Gb bandwidth coming soon! This entry was posted in Featured News, Press Releases, Events. Bookmark the permalink.